This summer I am struggling with finding snacks that I can/want to eat. I am currently 22 weeks pregnant and about 80% of my meals are forced because of my a) lack of appetite b) sensitivity to smell and c) just because something tasted good yesterday- does NOT mean it is good today! I have had to get a bit creative with my snacks and meals. I am usually a planner with meals and my husband and I try to eat dinner together (work schedule allowing) to connect and see each other. Since little baby (gender to be known at birth) has come along, my husband eats most meals by himself with me dry heaving over the smell of what I have just cooked. Moral of story: snacks are good. I am what you call a ‘sucker’. I am that person that watched the infomercial and I am the person that will buy the new cooking tool for the kitchen and will never have to worry about cooking again. Enter the magical: dehydrator. I love everything that I actually make in the dehydrator- I just don’t use it that much. Healthy snacks are something that can easily be made in the dehydrator and keep for longer than almost everything else that you prepare. Below is my Strawberry Fruit Roll Up recipe. I hope you enjoy! Check in 8 hours (my latest batch took 12 hours in high humidity). Simply check by peeling up one side of mixture. It is done when nothing sticks to the parchment paper and it comes away clean. If some or all of it is still pretty sticky and not coming away, leave it for a while longer and keep coming back to check in on it regularly. You don’t want to over dry it. While you are pulling your dehydrator out, why don’t you make a few things? Apple slices and banana chips are awesome for a quick and tasty snack. Simply slice apples or bananas and sprinkle with cinnamon and sugar (optional) and place into the dehydrator until desired texture is reached. Make sure you place all dehydrated treats into air tight container for storage. Enjoy! Don’t Have a Dehydrator Yet? If you are in the market for a dehydrator, then you might want to start out slow and get one with just a few trays and that is not too expensive. Below is the one I whole-heartedly recommend because it is not too costly, has enough trays to be super useful at making bigger batches, but not over the top, and it is well reviewed on Amazon, so you know hundreds of people before you have tested it out. 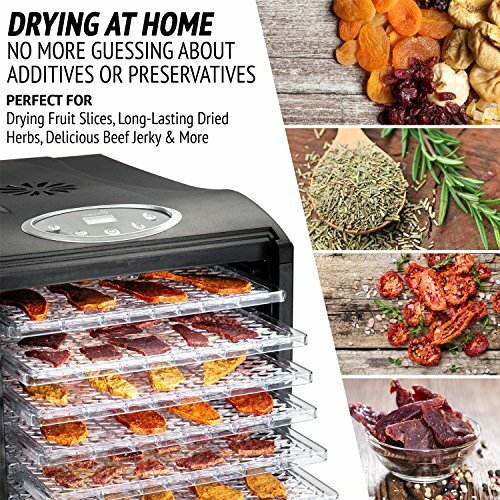 This one from Ivation is a hit on Amazon and not too expensive given how costly dehydrators can be (sometimes hundreds of dollars). I consider such a kitchen tool an investment, as it saves me lots of time and money in the long run. It comes with 6 Spacious, (13” X 12”) trays and can be used for anything from roll ups like this recipe, to drying herbs or making jerky. As I said, a great investment.